Photo by Joseph Robertia, Redoubt Reporter. 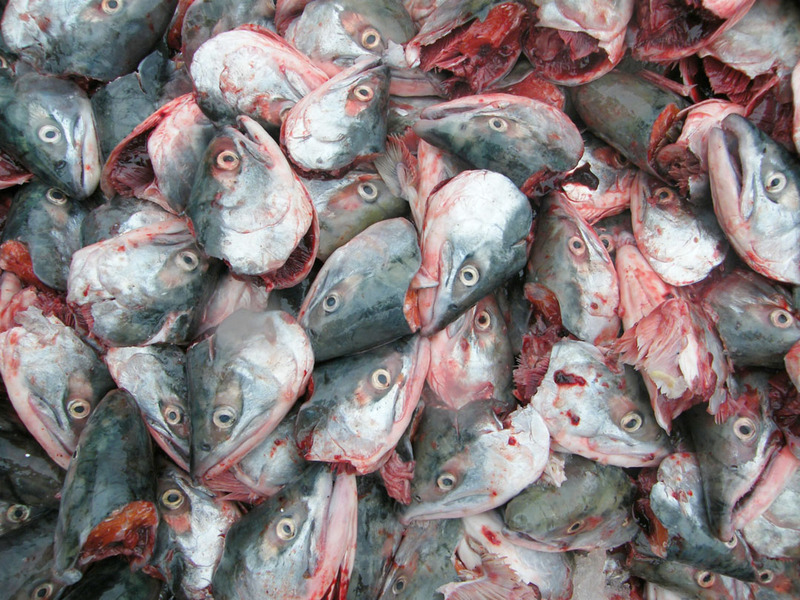 Fish heads, spines and organs are generally discarded after the meat is filleted off. Scientific Fishery Systems is leasing space at Kenai Landing this summer to refine that waste into marketable products. It’s hard to miss that Kenai is a fishing community. This isn’t just true in terms of sport fishermen coming to catch the king salmon of a lifetime. The area also hosts a commercial fishing industry and is home to fish-processing operations. In all these endeavors, the succulent pink meat is filleted from various salmon species, but little is done with the rest of the fish, which includes the head, spine and internal organs. For decades these “byproducts” have merely been ground up and dumped back into the ocean. Now a new approach will soon be making the most of some of that waste. “With cattle, pork and chickens, they use every part of the animal for something, and we should be doing the same thing with salmon. We should be working toward full-utilization technology, and this is a step in that direction,” said Patrick Simpson, president of Scientific Fishery Systems, Inc., an Anchorage-based business that has leased space at Kenai Landing for the summer season as part of a two-fold project to reduce the impact of fish-waste disposal practices, while simultaneously creating economic value. “Our goal is to take everything they can give us,” Simpson said. This includes salmon heads that will be collected from the three of the four of the largest local processors. Snug Harbor Seafood, Inc.; Pacific Star Seafoods and Salamatof Seafoods, Inc., are the three participating processors. Inlet Fish Producers, Inc., is not participating at this time. Simpson was in Kenai last week to oversee the assembly of the extraction equipment, leased from Alaska Marine Nutrition Co., which will be used to process the heads, primarily, into human-grade fish oil for sale to nutritional supplementation markets in the Lower 48. Photos by Joseph Robertia, Redoubt Reporter. 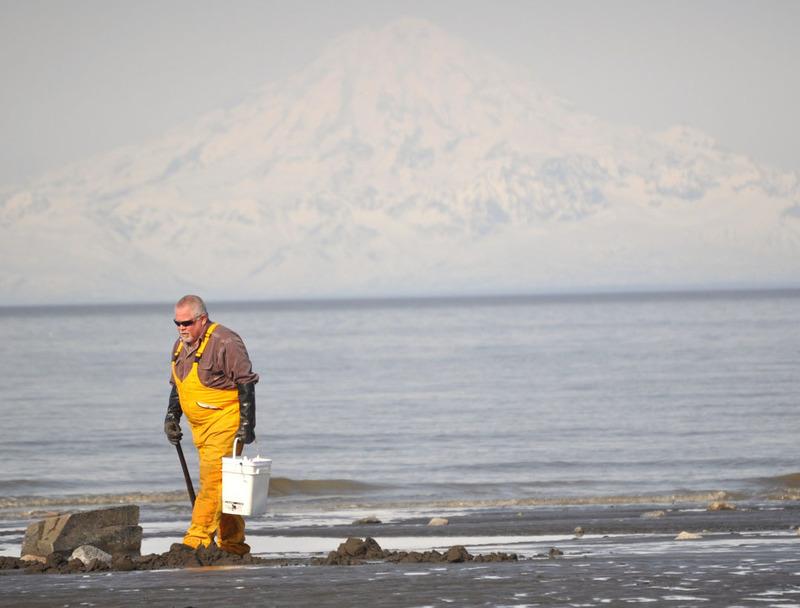 Rudy Bryant, of Bird Creek, scans the beach for signs of dimples while clamming just north of Clam Gulch on April 19. At minus 5.5 feet, the low tide was the lowest of the season. Below right, while most were small, there were numerous razor clams dug. As the tide slipped farther and farther away, they began to descend. At first it was just a handful of folks — dragging a spade in one hand and an empty bucket in the other, dressed in bright, water-repellent slickers or earth-toned hip boots. But before long there were several dozen people gathered at the water’s edge in Clam Gulch. From cherry-cheeked children missing a day of school to dig for their first time, to silver-haired seniors who have come annually for decades, they walked with their heads down, scanning the black, sandy shoreline. Rocks submerged just an hour before now stood high and dry, the neon pink, green and yellow anemones stuck to them with their tentacles pulled in and closed up tight to wait until the tide turned in a few hours. Photo by Jenny Neyman, Redoubt Reporter. 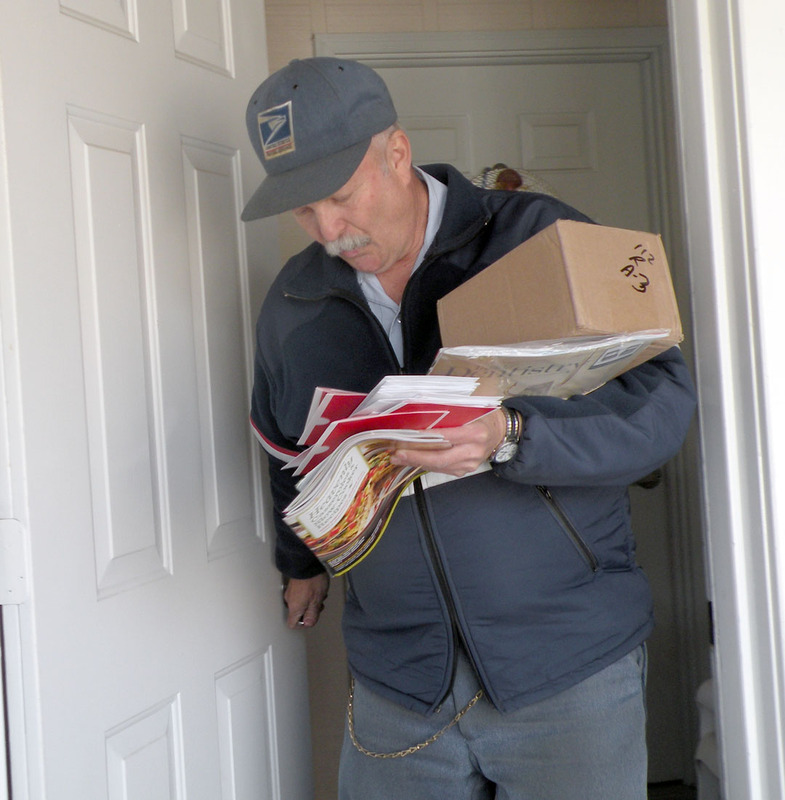 Rick Huddleston delivers mail in Soldotna last week. He retires Friday after a 41-year career in governmental service, with 38 years spent in the U.S. Postal Service. In his 25 years as a carrier in Soldotna, he’s well-known for his cheery whistling and sunny attitude. There’s catalogs, postcard reminders of dental checkups, bills and the other printed detritus that’s part and parcel to being a named, addressed member of society. Aside from the occasional quirk — wedding invitations, notice of jury summons, a package bearing the results of Internet impulse buying — the arrival of the daily mail is unremarkable, one second inhabiting its slot, the next shuffled off to the trash, filing system, or waiting-to-be-dealt-with pile. As ubiquitous as credit card offers, as autonomous as breathing. On Friday, Whistling Rick’s 25-year show in a 20-block section of Soldotna will come to an end. Residents of the section of Soldotna bounded by the Kenai Spur Highway, Sterling Highway and Knight Drive get mail rain or shine, ice or wind, smudged labels or unstuck packing tape, 30 below or 30-foot breakup puddles. Thanks to Rick Huddleston, they also get a tune. “That man is always whistling. He has never walked in that door not whistling, not once. I don’t think he’s ever had a bad day. I don’t know how that’s possible, but he’s always cheerful. He is exceptionally endearing,” said Autumn Leach, at Planned Parenthood on Redoubt Avenue, which is one of the 75 businesses to which Huddleston delivers mail. There’s no mystery about the mail in that section of town. It isn’t some unnoticed system operating in the background — out of sight, out of mind, out of earshot. With Huddleston, the arrival of the mail is an event, brief and efficient, yet noticed all the same. It starts when he pulls up and shuts off the engine. His midheight, midweight frame gets out of the truck — always in his gray slacks and red-and-white-stripe-on-blue jacket, the same blue as his eyes, and almost always with his trimmed gray moustache curved around his pursed lips. Postal customers in the vicinity know their mail delivery is imminent. “It’s loud. But when I say it’s loud I don’t want that to sound like a bad thing. It’s just, you’re inside your building and you know when the mailman’s here. You can hear his whistling from inside,” said Dawni Giugler, of First American Title on Birch Street. Orie Moore, of Dr. Justin Moore’s orthodontia office on Binkley Street, likens it to childhood memories of the ice cream truck coming to her neighborhood. The tinny, tinkling notes from the truck’s speaker was a signal to scrounge up spare change and decide what treat she’d order. Now the cascading notes are a last-minute reminder to make sure her envelopes are stamped and ready. Huddleston whistles while carrying mail to apartments at Laurawood Arms in Soldotna. coming, he’s going to be here any minute now,” Moore said. The notes crescendo as Huddleston’s quick steps approach the door, then stop as he enters, replaced with a smile and greeting — always by name — of his customers. “He makes a point of learning everybody’s name. When they’re new he makes sure he gets their name right away and calls everybody by name,” said Laura West, of First American Title. 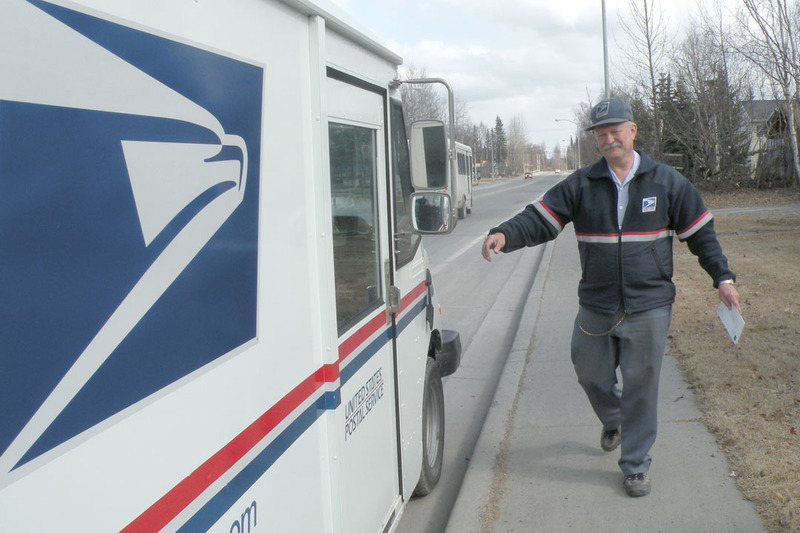 Huddleston has been delivering mail to the Moores’ office for the entire 25 years they’ve been in that location, and longer than many have been in his delivery area. Households and businesses have come, expanded, downsized, relocated or gone altogether. But the addresses have remained, and Huddleston has been the merry, melodic mailman attending to them since he took up the route in 1985. There have been vacations, a busted shoulder, a knee operation and other influences within that span that led to brief periods of silence, where just the mail was carried, without a tune. That was more jarring than if delivery was late or packages were misdirected. Editor’s note: This is the first of a two-part story about Kenai’s Gwen Gere and her life among books. This week’s story introduces Gere and the famous family business in which she grew up. Next week, part two will focus on the rise and fall of that business, and what its existence meant to Gere and to Alaskans. Photos courtesy of Riemann collection. This pre-Good Friday Earthquake photo shows the downtown store in the early 1960s. The name of the store at this time is The Cache. In The Bookstore at the Kenai Peninsula College’s Kenai River Campus, tucked away in an office behind the last row of textbooks, bookstore manager Gwen Gere sits, ordering, tabulating sales and expenditures, and planning. Although it might not be plain for the casual observer to see, Gere is hard at work at more than just a job she loves. Working with books is a job that is perhaps — especially given her family’s place in the history of Alaska literacy — even in her blood. Gere is the second child of Russ and Doris Riemann, who came to Alaska in 1953 when Russ agreed to take over the managerial duties for a floundering Alaska News Agency, which was headquartered in Anchorage. 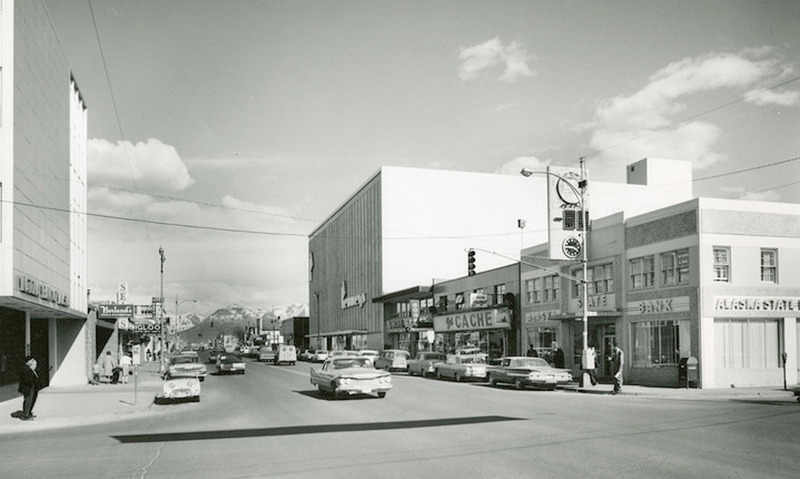 In the late 1950s, the Riemanns parlayed their knowledge of the wholesale distribution of reading materials into a new retail establishment — The Book Cache — which would become Alaska’s preeminent bookselling business for the next three decades. Photo courtesy of Christine Cunningham. Sadie Hallmark carefully sights in during target practice. 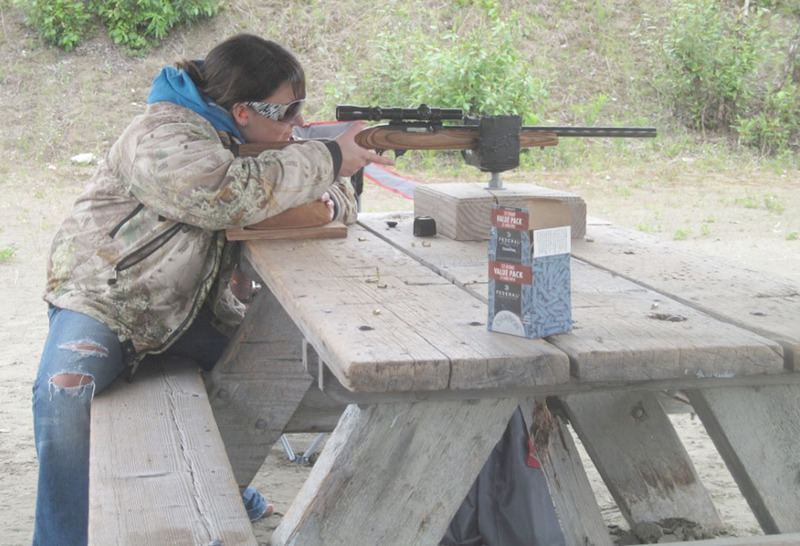 Anyone failing to observe the rules of firearms safety is an easy target for getting sharply reprimanded. I mounted my trap gun and made sure that my eye was focused just over the barrel in the mirror. I wasn’t taking my cue so much from the scene in “Taxi Driver,” where a young Robert De Niro points his gun and asks the image in his mirror, “You talkin’ to me?” I had it on good advice that if I was mounting my shotgun correctly, my eye would be just over the bead. But, since I was alone, I went ahead and asked the famous question. Somewhere in my imagination, a bright orange clay target quivered in fear at my intimidation. The first of the four basic firearms safety rules is, “All guns are always loaded.” It doesn’t mean, “Always keep your gun loaded,” although it could be taken to have this meaning. The rules are verbatim, so I cannot amend the first rule of guns, or I probably would. The rules have been memorized by countless firearms instructors, and adding to them would require a commentary equal to the entire Western Canon. Photo courtesy of Jen Ransom. Peppers do best when only transplanted once, so starting in a 4-inch pot allows for eight weeks of growing before moving to the greenhouse in either gallon pots or raised beds. It turns out that peppers, a perennial from the tropics treated as an annual here, do really well in Alaska. The formula goes, according to a recent lecture from Kasilof’s Winter Greens gardener Amy Dimmick, greenhouse plus long summer days equals very hot greenhouse great for growing peppers. I had decided to try my hand at peppers a few weeks earlier, so hearing Dimmick give a big hurray for peppers helped boost my confidence that my new-plant-of-the-year choice was a winner. Each year I try to grow something new, and this year the pepper plant made it to the top of the list. 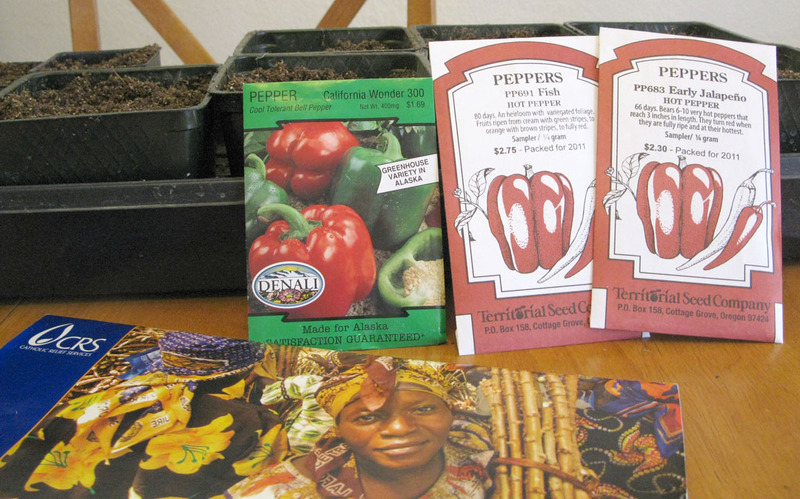 Well, three plants, really — two hot pepper varieties, fish and early jalapeno, from Territorial Seed Company, as well as a cool-tolerant sweet bell pepper, California Wonder 300, from Denali Seed Company. They’re best planted eight weeks before outdoor planting. Be forewarned, my research suggests germination is slow and erratic, so just plant, water uniformly and wait (in good lighting). Sometimes discussions seem to repeat themselves and we have that moment of déjà vu. At two different gatherings recently, the topic of discussion turned to canning salmon. It was obvious that I am not the only person thinking about the arrival of summer and fishing season. These comments made me think about how important food preservation has been in the history of mankind. Being able to gather food and keep it until it sometime later has enabled humans to populate new territories and become more stationary. It has probably been a major reason the human species has been able to grow to a population of 7 billion. Many Alaska communities grew because there were canneries where plentiful salmon was caught, processed and stored in metal cans. Other communities flourished because fish, like herring, were captured and then salted as a means of preservation. These fish products were then shipped worldwide. Long before the canneries and saltries existed in Alaska, our local Dena’ina and Ahtna Native populations knew how to preserve late-run salmon in ground pits. The pits were lined with bark, and layers of fish were covered with moss and grasses.